I'm having an aggravating week. The Bear is away and we're back to the primitive life we had a taste of last week: the utility company laying underground cable on our street hit the water-main yet again but this time it's worse. It's now day two without water. I'm alone with the kids, I'm tired, I can't cook or clean properly and it happens to be that special time of the month. I feel like I'm going to lose it. When the Bear returns, he will find me running up the mountainside like Maria von Trapp. In the midst of this, I received an Evite for a birthday party to be held on Saturday morning. The guest of honor is a preschool friend of the GB's. I have to be honest: the notice was really short and that irks me a bit. I have a lot going on. I don't even want anyone to see me right now. I've been wearing a hooded sweatshirt, with the hood actually on my head, for the school driving. I probably look scary. I decided to make a gift for her. I have plenty of time for handicrafts, what with all the cooking, dishwashing, laundry and toilet-cleaning I'm not doing this week. I crocheted a hat for the GB's friend, and I'm happy with it. I hope our little friend will like it too. I used a basic hat pattern which is a free Ravelry download, the Toddler to Kids Beanie by Knittwittz. The embellishments are my own design. I used only yarns I already had in my stash. I wanted the hat to be cute and feminine, but I don't think that has to mean pink. I love pink, as does my own daughter, but I like to branch out too. All the yarns are worsted acrylic; the cream is I Love This Yarn and the mustard, pale green and aqua are a mixture of Vanna's Choice and ILTY (I'm not positive which is from what brand anymore). 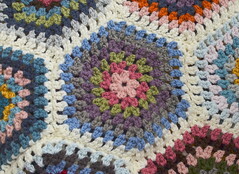 The crochet is all done with an I (5.5mm) hook. I also used one small flower-shaped button from my collection, along with a needle and plain white sewing thread. The hat pattern is so easy. I can honestly say that I whipped this up in a flash. I think the whole project took me about ninety minutes. 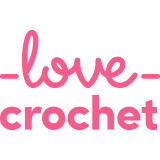 If you have some experience with crocheting in the round, it will be quick-quick-quick. I really did blitz this one; I think there were sparks flying from my hook. I will say that the Ravelry download contains an error; in the "young child"-size directions, which is what I used, Round 4 is written incorrectly. It's a minor mistake, but there should be 2dc in every third stitch within the repeat area. The pattern leaves off the "2" and that's confusing. Otherwise, it's a nice pattern and very straightforward. I decided to make the final three rounds (which are worked even, in single-crochet) multi-colored. I like stripey hats. Putting a few bright stripes near the face can brighten the wearer's eyes, I think. This little girl has very pretty blue eyes and I think these colors will look nice on her. I was originally thinking of crocheting a big flower to sew onto the hat but I got the idea that a bow would be cute. The bow is my own design, if anyone would like to try it. I simply crocheted a rectangle and cinched it in the center. For the rectangle, I chained 14 and starting in the third chain from the hook, made a double-crochet in each chain to the end. I did four rows like this (ch2 to begin each row) and tied it off. Then I took a piece of the same yarn about 36 inches long and wrapped it around the center to cinch the rectangle into a bow shape. I knotted the cinching yarn on the back and cut the ends. With sewing thread and a needle, I sewed the bow onto the hat. Then I sewed the little flower-shaped button onto the center of the bow. My friendly local hat model approves. She thinks it's comfortable and she likes the bow. Phew! I think we're ready to party. I felt a little panicky there but I'm happy that I have the chops to pull off a cute, handmade present with short notice. 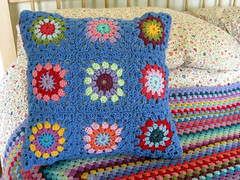 Crochet is a very handy skill, as I'm reminded time and again. It turned out adorable! I think it'll be a hit, and good for you for getting it done on short notice. I don't know how you are managing without water. Ugh! We are so spoiled, aren't we? Hee-hee. I would be beside myself, even without kids! Your had is darling. Isn't it nice to be able to make things like that for gifts? Kids don't realize how special they are, but we do. So sorry your week has not been good. It must be so frustrating for you but hopefully your Bear will be back very soon. Things always have a habit of going wrong at the most inconvenient times! Your hat looks good and I'm sure will be well received by the recipient. Take care. Even under these frazzled circumstances, you managed to create a gift perfect for your little friend! It's sweet, and love the colour combinations. Hope everything gets sorted out fast, Jennifer, but until then, keep calm and crochet on. Sorry your week hasn't been good but I hope things will be looking up for you. I feel so badly about your lack of water. My motherly instinct wants to box up a bunch of bottles and mail them to you! What a pain to work around that issue. But, as always, you made the best of things. That hat is just precious and the little birthday girl will love it. Your model is adorable! She comes through for you every time, too! Oh no you poor thing, it aways happens to me also when my husband is away for weeks at a time, I know it gets you down. Cute little hat. Bravo on the hat gift.. you're right, it's a GREAT skill for things like this. I am so sorry to hear that you are having a rough week. I hope tomorrow is a better day for you! And I hope your water is quickly turned back on. The hat is adorable, and I love the sweet little bow! Great job with such a really short notice! Oh...poor Jennifer...I really feel for you and the kiddies...no water is NOT FUN!!! I hope when yours gets home....he brings you some flowers!!! That is crazy!!!! How do they hit the line again?!? And no water?? You are a saint! I would be losing it too! The hat is beautiful friend! The colors and the bow are spot on!! I wish I had your skills! You hang in there .... I was there today too! P.D. Oh, I almost forget, the hat it's very nice! What a nightmare for you and the children, let's hope the workman get their act together and reconnect your water as soon as possible. In the meantime 'chin up', you've done a fabulous job on the little crochet beanie and I'm sure they'll be one very happy little bithday girl proudly showing off her new hat on Saturday. The little hat is lovely, a perfect birthday gift. Sorry you have had such a rotten week, hope things improve really soon. Jennifer, I hope that you are feeling better as you read this. I love your honesty, and I love the hat. What a nice touch with the stripes. It must be wonderful to be able to whip one of these up. I'm struggling on with my knitting. Actually I am enjoying it very much. I'm using youtube tutorials. They are very helpful. I hope your little girl bear had a nice time at the party, and that her friend liked the hat. It's so pretty, I'm sure the little girl will love it. Hope things are back to normal, water wise, today. Being without water is a stress we can all do without, though I think when something like this happens it makes us appreciate how we often take things like water for granted. Oh my! what a cute hat and such a pretty model! Its gorgeous, someone is going to be very happy with that! Okay, I just saw the comment you left today. I don't know if you meant to say what you did, but it caught me off guard and made me bust out laughing! It's quite okay because I cuss like a sailor, but I didn't expect it. I had you pictured as prim and proper. Ha-ha. Not that you're not proper, but you know what I mean. It just made me laugh. I hope you have water by now! Oh Jennifer, sorry that it's all a bit of a trial at the moment. I do hope the water is back on soon. It must be an absolute nightmare without it. The hat is lovely, clever you. I wish I could crochet like that. I would like to knit a couple of hats if I could, but first I have to do a red and black striped scarf for the littlest boy, so that he can cheer on his brothers at their football matches. I hate being without water, we have been there many times thanks to sewer work in our city :) I hope that it gets turned back on quickly! The hat looks great, I am sure that it will be a great birthday gift! (and I hate not getting lots of advanced notice for parties also, I like to have everything planned way ahead of time). I'm so sorry you're having a bad week...being without water is horrible; it's happened here a couple of times. How are you even going to the toilet?! (OK, never mind...I might not want to know, lol.) On the bright side, the hat you made is absolutely darling. Love this little hat, wish i could whip up something this beautiful so fast! What a lucky recipient! Sorry to hear you were having a tough time last week, I hope your weekend has been calm and relaxing!